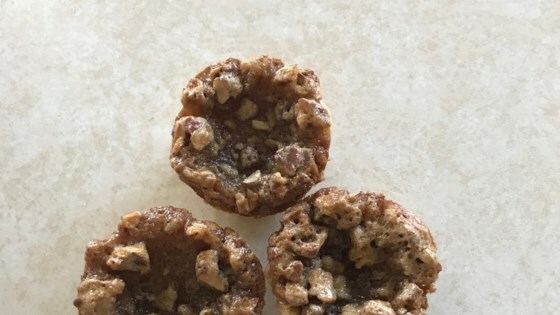 "I came across this idea when looking to serve favorite desserts in a cute and bite-size portion! The only work involved is the cutting out of your pie crust circles! You will wow your guest and friends with the presentation!" Preheat oven to 350 degrees F (175 degrees C). Spray 12 mini muffin cups with cooking spray. Mix white sugar, butter, and flour together in a large bowl until well combined. Add eggs, 1 at a time, and mix well after each addition. Whisk corn syrup and vanilla extract into sugar mixture; fold in pecans. Roll pie crust pastry onto a floured work surface; cut into circles using end of a drinking glass or a biscuit cutter. This will make 11 crusts. Roll the scraps into a ball and roll back onto the floured surface; cut 1 more circle. Press each circle into the prepared muffin cups. Repeat with remaining pie crust pastry. Spoon pecan mixture, about 2 tablespoons per pie, into pie crust pastry. Bake in the preheated oven until set, about 18 minutes. Allow tarts to cool in muffin tins for 5 minutes before loosening edges from sides of tin; let rest 5 minutes more. Transfer tarts to a wire rack to cool completely.